USC Marshall ranks #1 for private schools, #1 school in the West and #5 in our national ranking. Congratulations! In your opinion, what are the key reasons why USC is so highly ranked? High-quality asynchronous materials created by dedicated instructional designers working with faculty and career media/production staff. The content and production have been recognized with the Telly, Davey, and Online Learning Consortium awards. USC Marshall USC Marshall alumni engagement from the initial on-campus immersion week. Diverse, intellectually curious professionals, ambitious, managers, entrepreneurs, and leaders who can contribute business experience and learn from others typically enroll. Students’ average work experience is 10 + years; 56 students have a masters, Ph.D. MD, or JD. The average salary for the Fall 2018 cohort was $114,000. 55 % live outside of the LA or Orange county areas. Tell us about your highly integrated approach to “Live” learning online. Students prepare materials and complete readings, case studies, and exercises on their own time prior to two interactive sessions per week. Then on two evenings, faculty lead the students in cohort discussion and small group meetings using the synchronous platform. Additionally, students collaborate on team projects, compile work in their e-portfolio, and contribute to a capstone project which is submitted in the final semester. They function as a cohort with multiple small team projects. Enthusiastically. Both students and faculty have praised the relationships, forged in the weekly interactive discussions, office hours, team projects, and on-campus social events. USC’s Online MBA is training the leaders of tomorrow in forward-leaning topics like remote management, data analytics, social media and more. How is USC leading the way in the business of tomorrow? Business today is digital and collaborative; its leaders are in our classroom learning from faculty and one another and building tomorrow’s business on a digital platform. Based on corporate focus group findings, our curriculum includes business analytics and business communication in all five courses and includes a class on virtual-collaboration best practices and virtual team-building. Unlike other MBA programs, Marshall students examine a business challenge or opportunity through multiple perspectives, a practice maintained through five semesters, thus demonstrating, mirroring, and enacting a collaborative conference-room business practice-—for example, the students’ first course is taught by micro-economics, accounting, marketing, and statistics professors. Our students report they work in this manner and on similar platforms in their own companies. Professional resources are provided by career coaches, classmates, alumni, and monthly executive guest speakers. Perhaps because almost 40 % of the students receive corporate support, a few have hired classmates for their company. We consider the extraordinary faculty collaboration with one another, students, and with the instructional designers and media/production team without parallel. Recently, a capstone project has evolved from the final course assignment to assignments in all five courses. This full curriculum development process differs from offering one capstone project in one course; Marshall’s capstone establishes a five-course business case study. Companies are not typically recruiting our students. Marshall’s MBA online students have an average of ten years work experience; many possess multiple degrees, and managers’ and C-suite salaries. We are told that they are generally over-qualified for most on-campus recruiters. Bring a learning attitude, enthusiasm, professional experience, and a desire to contribute to the business and wider global community. Plan to invest 20-30 hours per week for 21 months, and you’ll see the return on your investment. 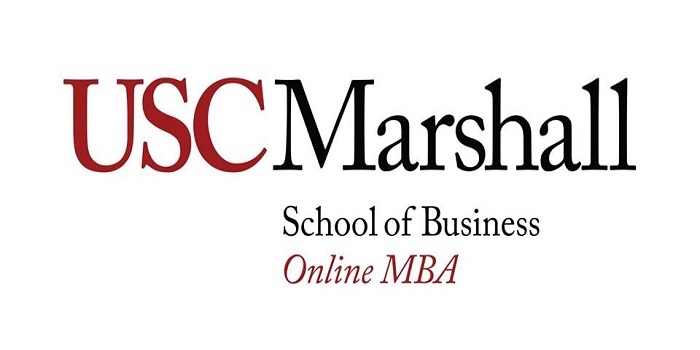 Why should a prospective MBA candidate choose USC Marshall? Prospective candidates should choose the Marshall online MBA because it offers a unique 21st century learning opportunity—a multi-discipline five-course curriculum, quality discussions and feedback from campus faculty, executives, and high-achieving classmates. Plus the privilege to join the renowned USC Marshall alumni. Thanks to Sandra J. Chrystal for participating. For more interviews, check out our Online MBA Report Interview Series.